Slow cooker ribs are the best, most tender, flavorful ribs you’ll make! These are just about the easiest thing in the world and the meat just falls right off the bone! My husband is straight up obsessed with pork. The man would eat it for every meal if I weren’t around to shove beef, chicken, and a stray vegetable or two at him every now and then. Man cannot live on bacon alone, my dear husband. Anyway, I’ve come up with some crazy amazing pork deliciousness over the years. My pulled pork is literally the best thing ever. I make it almost every time we have a big family get together, because not only does everyone love it, it’s easy. Today I’m here with something porky, but different! Slow cooker baby back ribs! Y’all are going to flip for how simple this one is. This is the easy part, friends. You literally just coat the ribs in my homemade BBQ dry rub. The dry rub consists of brown sugar, paprika, garlic powder, onion powder, salt, pepper, and parsley. 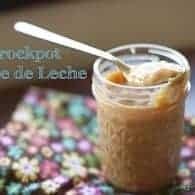 Super easy stuff that you probably have in your cupboards. Sprinkle that over your ribs and rub it all in on both sides. Add some apple cider (or apple juice!) to your slow cooker, pop the ribs in, cover, and cook! Every slow cooker heats differently, but mine takes 4 hours on high and 8 hours on low. If your crockpot cooks hotter, you can reduce the same as needed. 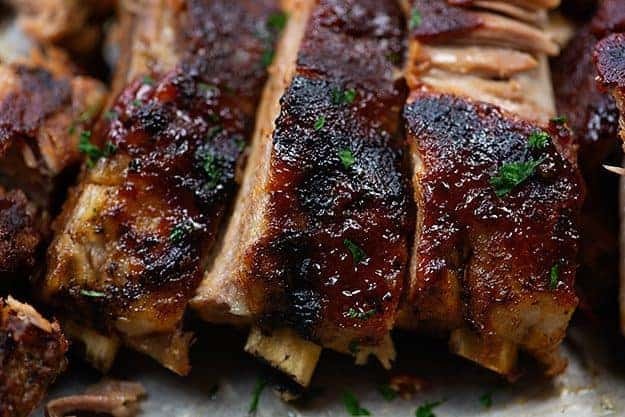 These slow cooker bbq ribs get pulled out and popped on a baking sheet. Slather them in my Carolina BBQ sauce and then pop them under the broiler for a couple of minutes. 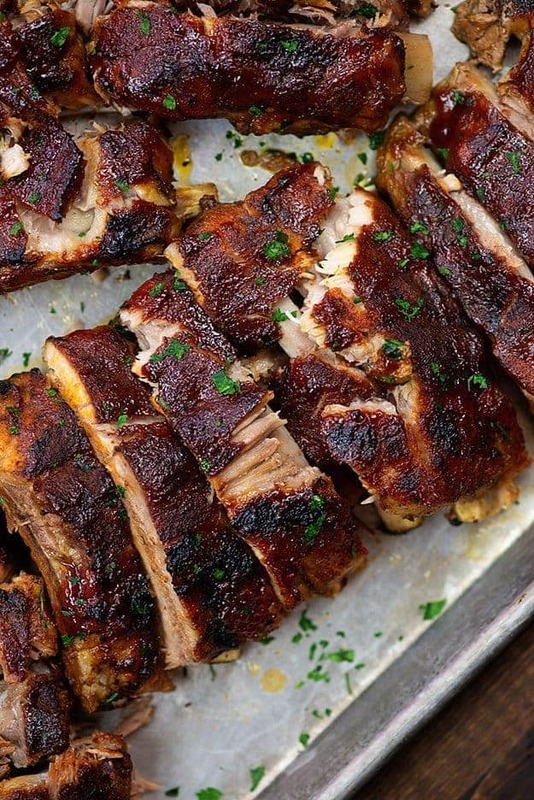 Once the barbecue sauce starts to caramelize, your ribs are ready! 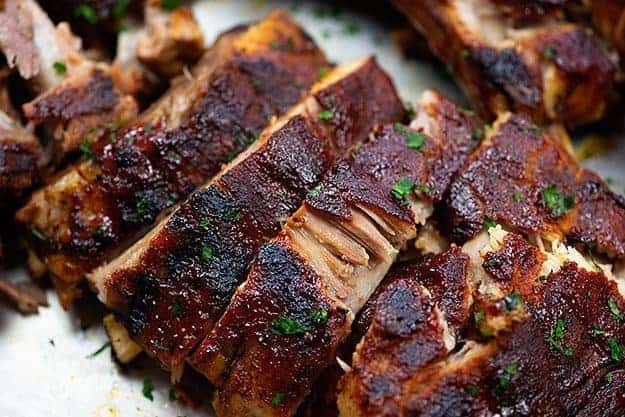 These are seriously best slow cooker ribs!! Oh goodness, there are so many tasty possibilities! We always have my coleslaw recipe with ribs. 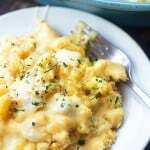 Jiffy corn casserole is a definite hit. Cowboy beans, cauliflower potato salad, and crockpot hashbrown casserole are all amazing as well. 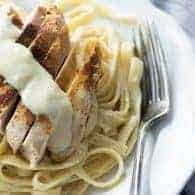 If you love using that crockpot to make dinner time easy, I have some tasty recipes you should try! My French dip sandwich is the most popular recipe on this site! Crockpot BBQ chicken, crockpot pork roast, and crockpot chicken and stuffing are on repeat at my house month after month. Serve these ribs with some cucumber tomato salad and crockpot mashed potatoes! These crockpot BBQ ribs are super simple and ready in no time! Toss them in your slow cooker and then baste with sauce before broiling to perfection. Cut each rack of ribs in half so that they fit easily in the slow cooker. In a small bowl, whisk together the paprika, brown sugar, garlic powder, onion powder, salt, pepper, and parsley. Sprinkle the dry rub over each side of the ribs and use your hands to press it into the meat. Add the apple cider to the bottom of a slow cooker and place the ribs in the slow cooker. Cook, covered, on high for 4 hours or low for 8 hours. When ribs are nearly falling apart, carefully remove them from the slow cooker to a large baking sheet. Brush with barbecue sauce. Place under the broiler until the sauce has thickened and begun to caramelize, about 5 minutes. Can you place them on a grill instead of a broiler? I’m sure you could! Great idea. Oh my goodness!! 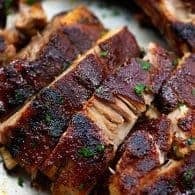 SLow cooker baby back ribs – I love it!! 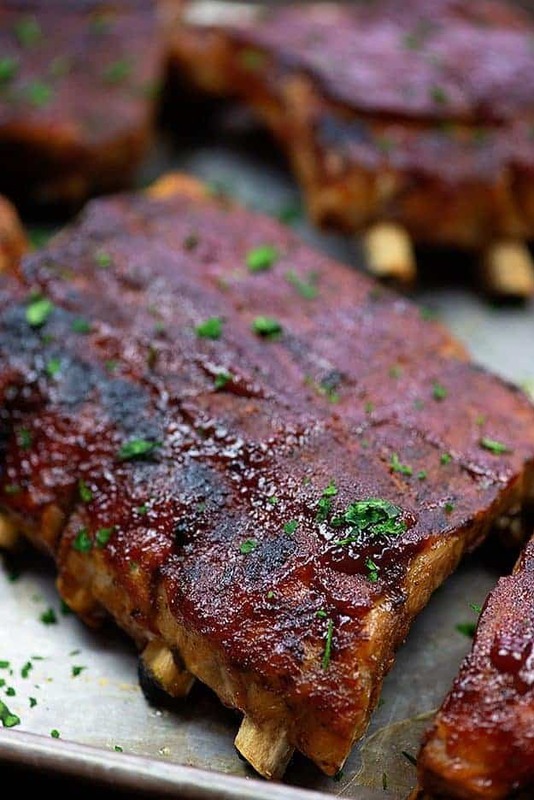 With the eating machine (aka my son) comes home for the summer this weekend – this recipe is going on my list to make ASAP – those ribs look fabulous!! This is my kind of recipe! 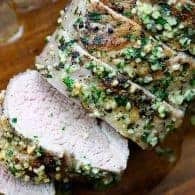 The dry rub has such amazing flavors and you cannot beat using the slow cooker to do the heavy lifting. Love it, pinned! I love ribs and these look so good. I have never tried them in the slow cooker. I’m going to have to try these ribs. They are in the Crock-Pot now! Can’t wait! Just out of curiosity…why apple cider vinegar? Does it add flavor sitting in the bottom? Hi Brooke! You add apple cider, not apple cider vinegar! And it does add flavor. 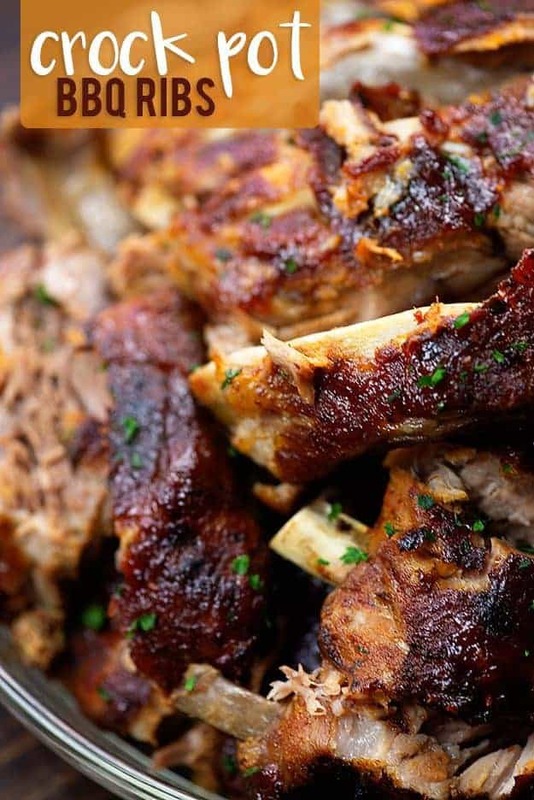 I’d try to dump the vinegar if you can…those ribs might be a bit tangy otherwise. These look absolutely delicious!! I can’t wait to try these! Thanks for sharing! I made the ribs ! They were delicious, but they didn’t need 8 hours, the mest was falling off the bone ? 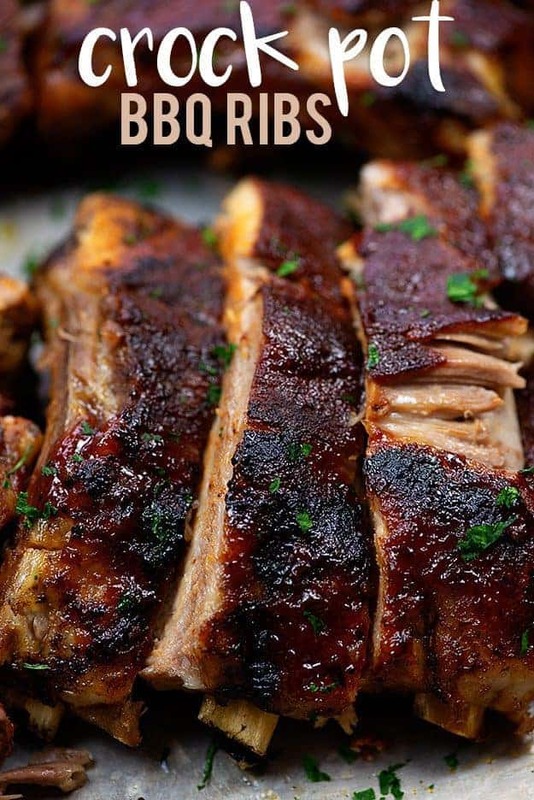 I used to do my ribs this way .. 4 hurs and so yummy, but discivered a new way this year …. ans a lot quicker. 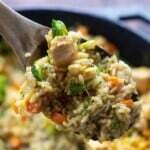 Thomas Chandler – pressure cooker version sounds like a brilliant variation! Thanks for sharing the tip. Can I make this with non-baby-back ribs, such as pork country spare ribs? I think that would work fine, though I haven’t tried it myself. I am a die hard charcoal griller, but you have never let me down so I am going to give this a try, I will let you know. Well they do look spectacular! I need to use my slow cooker more often! This is genius! Is it just apple cider or apple cider vinegar?? The amounts are all located within the recipe card. I would not use apple cider vinegar for this recipe. Made these tonight! They were awesome! Best… Easiest ribs ever! Thank you! So glad you gave them a try! I made these ribs and they were so frickin good!!!! I am just curious but how much degrees do you broil these bad boys at? I use a gas oven which doesn’t have a temperature setting for the broiler. Flames just come out of the broiler. I would guess around 500 degrees though? Just keep a close eye on them. Would like to know if apple juice can be used instead, will make this by the end of the week. Apple juice works just fine! 🙂 Enjoy! I’m not sure why, but I read apple cider as apple cider vinegar when I made this recipe last night ; despite my mistake, absolutely delicious. Saving this recipe for future uses! I did the same….not a fan at all. I should read it twice. Waste of ribs. Uh oh! I hope it still works out for you! This recipe is nasty, the only thing giving it any flavor at all was the bbq sauce…We are used to smoking our ribs, but since it was cold, I tried this recipe…I think if you use an good rub and let it soak in for 24 hours, it might turn out better, I will never cook my ribs any other way besides smoking them, it’s the best way. The ribs were falling off the bone and soft though. You can’t expect the same flavor of a slow cooker rib that you would from a smoked rib. They’re obviously going to taste pretty different. Ummmm NOTHING will taste the same as smoked meat?